Esterhazy- Hazelnut Meringue and Custard Buttercream Cake - Let the Baking Begin! 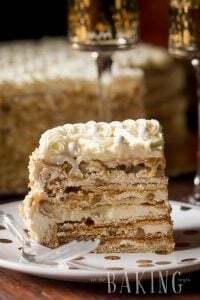 Esterhazy Cake is an Exceptional Hungarian cake made of Hazelnut Meringue layers and rich Custard Buttercream. The layers can be customized with a different type of flour like almond, or walnut. 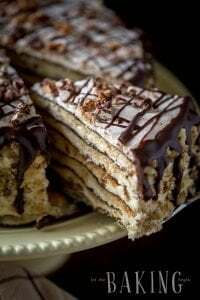 Esterhazy is a Hungarian cake made of thin hazelnut meringue (dacquoise) layers and buttercream that has egg yolk syrup as its flavor base. Originally, I believe it was made with almond flour, but since almonds themselves do not have much flavor, I decided to use hazelnuts instead. If you want to, you can even use both flours and make alternating layers as I did in my cake, although I’m not sure that it really made the cake any better than it would have been with just hazelnut flour, so in the recipe I included instructions on how to make all hazelnut layers. As much as our family does like anything with nuts, I just couldn’t imagine that the end result would be as good as it was though. The Esterhazy Cake has a very mild, but well-balanced flavor. The top glaze on the cake can be made with either lemon juice or milk, but I thought that the tiny bit of sourness from the lemon juice made the cake all that much better by giving it a tiny dose of ‘zing’. Not surprisingly, the berries, although not originally meant to be there, add a bright note, that I felt was very much needed. All in all, my whole family really enjoyed this combination and even though they usually will give their opinions on how well the flavors work and how a recipe might benefit from one thing or another, this one is perfect and doesn’t need anything else added or taken away. At least in our opinion. 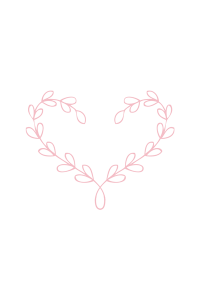 Let me know what you think when you make it! Preheat oven to 300F with the rack in the middle. If you do not have ground hazelnut flour, you can use a vegetable chopper or a food processor to chop the hazelnuts very finely. Using an 8 inch round baking pan, trace a circle around it on parchment paper, cut around it giving about 1 to 2 inches extra. Now repeat it enough to get 10 circles. Whip 10 egg whites on high in a thoroughly clean from any grease bowl until frothy. With the mixer still running start to gradually add 1 1/4 cups sugar, about one tablespoon at a time. Once the sugar is added, whip the meringue for about 5 minutes. Now add the hazelnut flour in 2-3 additions, carefully folding after each. Do not fold too much or the batter will deflate and not make proper dacquoise. Divide the batter between all your parchment circles and spread it within the drawn circle into a very thin layer. Now bake two of the layers at a time, by placing them on a baking sheet. Bake for about 5 minutes or until slightly golden in color. Remove from the oven and allow to cool without removing from the parchment paper. Continue baking all cake layers in this manner. If you use almond flour, your batter will be very white without the speckles you see in the batter made with hazelnut flour. Spread about 2 cups of sliced almonds on a baking sheet and bake, tossing often in a preheated to 325F oven until slightly golden, about 5-8 minutes. Watch the nuts closely as they go from done to burnt in a matter of seconds. Once roasted, remove from the oven and allow to cool. Combine 10 egg yolks with the 1 1/3 cups powdered sugar and whisk until smooth. Now add 5 tablespoons of all-purpose flour and whisk again until no lumps appear. While continuing to whisk, add 1 1/4 cups boiling hot milk into the egg yolk mixture being careful not to add too much at once or the egg yolks will curdle. Add the mixture to a saucepan and cook over medium heat while vigorously and continuously stirring until the mixture comes to a boil and thickens considerably. As the mixture starts to thicken it will look lumpy, but as you whisk it will smooth out. Cook for about 2-3 minutes past boiling, to rid of the flour taste. Cool to room temperature. Whip room temperature butter on high for about 5 minutes, stopping to scrape the bottom of the bowl several times. The butter should look pale white in color and very fluffy. Now in 2-3 additions add the cooled custard to the whipped butter, whipping in between to incorporate. Lastly add 1 tablespoon of vanilla extract and whip once more to incorporate. Do not whip more than necessary or the buttercream will separate. Place a dab of frosting onto the cake board or platter. Place your first cake layer on top and carefully peel off the parchment paper. Top with about two full spoons of frosting and spread around to make an even layer. Do the same with the remaining cake layers and frosting. Do not cover the top layer with frosting. Do not put too much frosting on each layer or you will not have enough for the sides of the cake in the end. The amount of frosting on each layer will seem like very small amount, but it is enough. Once done layering the cake, cover the sides of the cake with the remaining buttercream. Now make the glaze for the top of the cake. Add 1 cup powdered sugar, 1/2 teaspoon of vanilla extract and about 3 teaspoons of lemon juice and stir. If it’s hard to stir add more lemon juice until it’s thick, but spreadable. The glaze should not be too runny or it will run off the cake. Take away about 2 tablespoons of the glaze and add 1 tablespoon of cocoa powder. Stir. Transfer to a ziplock bag and close. Snip off a corner. Spread the white glaze on top of the cake, coming close to the edges, but trying not to let it go down the sides. Now make a spiral on top of the cake with the chocolate glaze. Next take a knife and make 8 stripes by dragging it from the middle towards the outside. Make 8 more stripes in between the first set by going in the opposite direction, from outside in. To cover the sides with sliced almonds, take a handful of slices and press them against the sides if you do not care about the design, or take whole petals of almond slices piece by piece and press them against the side of the cake. Looking at the pictures below you can decide how you would like to do it. Take about 16 oz of raspberries and arrange them along the outside border of the cake. Allow the cake to sit at room temperature for about an hour or two before placing in the refrigerator and leaving it there for about 12 hours before eating. 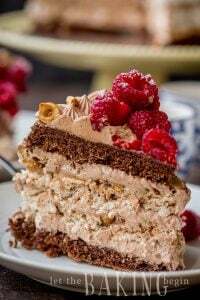 Chocolate Kiev Cake – Soft sponge cake layer with dulce de leche buttercream and layered of walnut meringue. Poppyseed Cake with Lemon Glaze – Moist poppyseed cake topped with a sweet lemon glaze. Cream Horns – Puff pastries filled with white cream and raspberries. Preheat oven to 300F with the rack in the middle. If you do not have ground hazelnut flour, you can use a vegetable chopper to chop them finely. Using a 8 inch round baking pan, trace a circle around it on parchment paper, cut around it giving about 1 to 2 inches extra. Now repeat it enough to get 10 circles. Whip 10 egg whites on high in a thoroughly clean from any grease bowl until frothy. With the mixer still running start to gradually add 1 1/4 cup of sugar, about one tablespoon at a time. Once the sugar is added, whip the meringue for about 5 minutes. Add the mixture to a sauce pan and cook over medium heat while vigorously and continuously stirring until the mixture comes to a boil and thickens considerably. As the mixture starts to thicken it will look lumpy, but as you whisk it will smooth out. Cook for about 2-3 minutes past boiling, to rid of the flour taste. Cool to room temperature. Place a dab of frosting onto the cake board or platter. Put your first cake layer on top of the dabbed frosting, and now carefully peel off the parchment paper. Top with about two full spoons of frosting and spread around to make an even layer. Do the same with the remaining cake layers and frosting. Do not cover the top layer with frosting. Add 1 cup powdered sugar, 1/2 teaspoon of vanilla extract and about 3 teaspoons of lemon juice and stir. If it's hard to stir add more lemon juice until it's thick, but spreadable. The glaze should not be too runny or it will run off the cake. 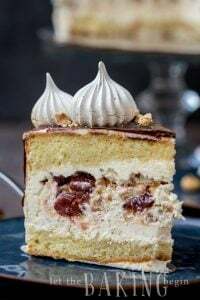 To cover the sides with sliced almonds, take a handful of slices and press them against the sides if you do not care about the design, or take whole petals of almond slices piece by peice and press them against the side of the cake. Looking at the pictures below you can decide how you would like to do it. This cake is amazing I’ve now made it twice in the last 3 days for two different events one for my daughter named Eszter and one for my Thanksgiving at work, it is a heritage theme. That’s amazing! Thank you so much for sharing and for giving the recipe a star rating! Hi I’m going to make this for an anniversary and noticed that your raspberries look as if they have been drizzled with toffee? Hi Sonia, I brushed on some warmed up apricot jam. Can I use regular flour for this cake or does it have to be specifically the ones listed? Hi Yelena, Thanks for the question! In this recipe only a nut flour can be used, otherwise the cake layers will not come out right. You can replace the almond flour with hazelnut or walnut flour. Hi Marina, I was wandering if I can add the butter to the warm custard and refrigerate it for a while to prevente it from curdleing ? Do not add butter to warm custard or it will melt and become runny. If your custard does start to curdle, you can warm it up a couple seconds at a time in the microwave until it comes together, but do not overheat or it will run and become too runny to fill. Hey Marina! I am currently making this cake. Are the cake layers supposed to be soft instead of crispy? Ok thanks, mine were soft and I was worried it would turn out too mushy and not crispy! But I’ll let you know how it turns out. So I made this 6 hours ago and just cut into a piece. The cake layers are soft, I was expecting more of a meringue crunch with this. But overall it is good! I think I will make the markiza cake instead next time. Yes, in this cake the cake layers are meant to be soft. 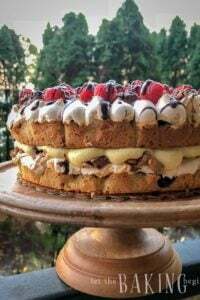 If you are looking for something more crunchy, Markiza, or Hazelnut Meringue Cake are good ones to try. Thanks for your feedback Katy! Have a good week! Would you clarify what exactly did not work out? May be we can troubleshoot it together. Well, I ground up the hazelnuts myself, as you indicated is possible. When the batter was made, it resembled a meringue moreso than anything – almost like flour was missing (maybe the hazelnuts weren’t fine enough?). But when I stuck them in the oven, they were so sticky and I couldn’t get them off the parchament paper after baking for your recommended time, so I kept the subsequent ones in longer. But when i did that, they were so crunchy and tasted like a meringue and would bake unevenly (crisp on edges and raw in the middle). I may try store bought almond meal next time. What are the layers supposed to be like after baking? Like a cookie, like a meringue, or like a soft cake-like consistency? You can easily make this cake one to two days ahead. The cake layers are meant to soften as they sit (which is why you want to wait at least 12 hours before serving), so even if it sits a little longer it will not worsen in flavor. Sure, just make sure the flavor goes well with the rest of the cake flavors. It’s not too tall, about 3.5 or may be 4 inches tall. Hi, Marina. Cake looks amazing. Do you think i can use sugar instead of powdered sugar for egg yolks custard? Yes easily. Just google to see how much that much powdered sugar weighs and use the same amount of granulated sugar in place of it. Hi, Marina. Do you think I could substitute corn starch for flour to make custard so it’s gluten free? Could you tell me if I can keep the meringue batter waiting at room temperature while baking them two by two. I live in a pretty hot country and always have my doubts about leaving food at room temperature mostñy if it is raw. You can bake it two by two, just make sure to spread it on parchment paper as soon as you whip it and then put two at a time into the oven, while leaving the rest on the counter. Those pictures are mouthwatering . What a great way to decorate the cake! Thanks so much Oksana for your feedback! Dear Marina, this cake is worth of every single minute of our time 🙂 Thank you and have a pleasant week end ! this is looks so awesome..it is very much my taste :-)..can’t wait to to try it. Marina, you are amazing! This is too beautiful to eat! You always do such an excellent work. I am impressed beyond words. Thanks for being so precise and detail-oriented. Your recipes always work. Thank you so much Yana! I really appreciate your kind words!